This product is suitable for travellers; it has been tested for stability after 1 month at 40°C. 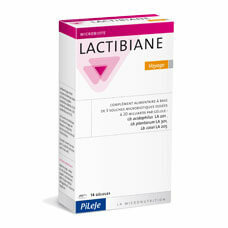 Lactibiane Voyage is a complex of microbiotic strains developed by the research and development department of Laboratoire PiLeJe. Microbiotic strains in Lactibiane Voyage selectively bred by PiLeJe are registered in the National Collection of Microorganism Cultures (CNCM). Start using on the day before departure. Bulking agent: corn starch, lactic ferments (carrier:maltodextrin), capsule of plant origin, anti-caking agent: magnesium stearate.